The Gγ-158(C→T) polymorphism plays important function in the clinical variability of HbE/β-thalassemia. There is little known about Gγ-158(C→T) polymorphism in HbE/β-thalassemia major in Southern China. This study aimed to explore the association between HbE/β-thalassemia major and this polymorphism in Southern China. The frequency of the Gγ-158(C→T) polymorphism has been evaluated in 32 patients with HbE/β-thalassemia major from Southern China. Further analysis of the Gγ-158(C→T) polymorphism revealed the prominent frequency of this polymorphic pattern among HbE/β-thalassemia major patients (65.63%). The presence of this polymorphism was strongly correlated with the increase of HbF synthesis. The frequency of the Gγ-158(C→T) polymorphism was relatively high in Southern Chinese patients with HbE/β-thalassemia major, often accompanying with high production of HbF. This feature appears to be different with reports in other races and regions. Hemoglobin E/β-thalassemia(HbE/β-thalassemia) is a common form of severe thalassemia syndromes in the Southern Chinese provinces. Clinical manifestations of these patients range from nearly asymptomatic to severe β-thalassemia disease. The Gγ-158(C→T) polymorphism (- 158 Xmn I Gγ-globin polymorphism) has been shown to be associated with the increased production of HbF and can strongly influence this heterogeneity of HbE/β-thalassemia[1–6]. The condition of the - 158 Xmn I Gγ-globin polymorphism has been rarely reported in HbE/β-thalassemia majors from Southern China. The present study was to investigate the frequency of the - 158 Xmn I Gγ-globin polymorphism and its association with high HbF level in HbE/β-thalassemia major patients of the Southern Chinese. The clinical data were collected from 32 patients with HbE/β-thalassemia major who were seen at the First Affiliated Hospital, GuangXi Medical University. We also collected data from and compared with 30 unrelated healthy individuals. Table 1 shows the existence of the - 158 Xmn I Gγ-globin polymorphism among HbE/β-thalassemia major and healthy controls. The frequency of polymorphism in HbE/β-thalassemia major (65.63%) was significantly higher than those in healthy controls (P < 0.00). In these patients, there were 6 β-thalassemia mutations detected in trans to the βE-thalassemia mutation. None of α-thalassmeia and homozygote of the -158 Xmn I Gγ-globin polymorphism were found in all samples. Fig 1. displays the association between the -158 Xmn I Gγ-globin polymorphism and HbF level among the HbE/β-thalassemia major. The HbF level in Xmn I +/- group was more than that in Xmn I -/- group, confirming the significant difference between these two groups. The analysis by Spearman correlation indicated that the - 158 Xmn I Gγ-globin polymorphism was associated with increased HbF systhesis (rp = 0.588). 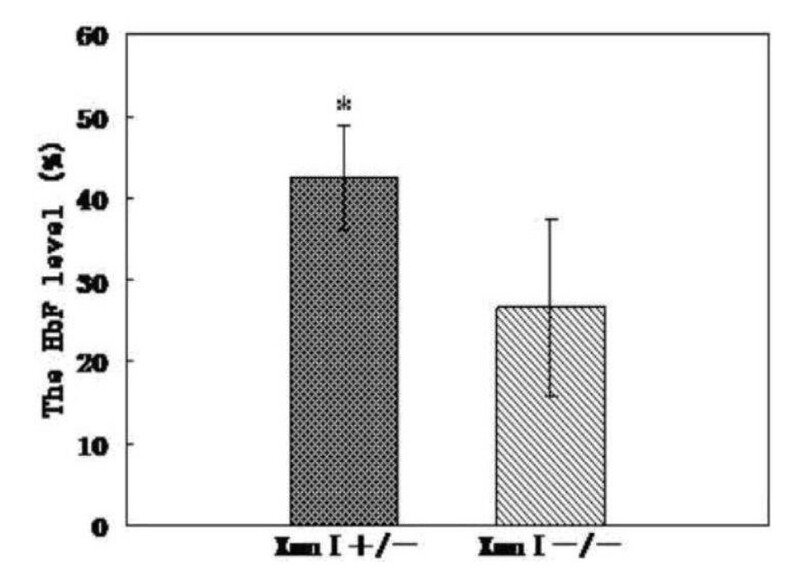 The difference of HbF level in Xmn I +/- group and Xmn I -/- group among the HbE/β-thalassemia major. The HbF level in Xmn I +/- group is obviously higher than in Xmn I -/- group (* P<0.01). In HbE/β-thalassemia, particularly in the major cases, during hematopoietic stress, point mutation at G-gamma promoter (the - 158 Xmn I Gγ-globin polymorphism) can induce high gamma chain production rate. The heavy hematopoietic stress from severe anemia may thus leads to the high frequency of this polymorphism in Southern Chinese patients with HbE/β-thalassemia major. This is the first report of the frequency of the - 158 Xmn I Gγ-globin polymorphism in patients with HbE/β-thalassemia major in Southern China. These data suggest that screening of the - 158 Xmn I Gγ-globin polymorphism and HbF level in early childhood may help on the management of HbE/β-thalassemia major patients and possibly prevent severe complications in Southern China. We are grateful to the investigators, Wei-Xiong Lin, and Yi-Dan Liang, Xuan Xiao for their technical assistance. This work was surported by grants from the National Natural Science Foundation of China (No. 30860307).